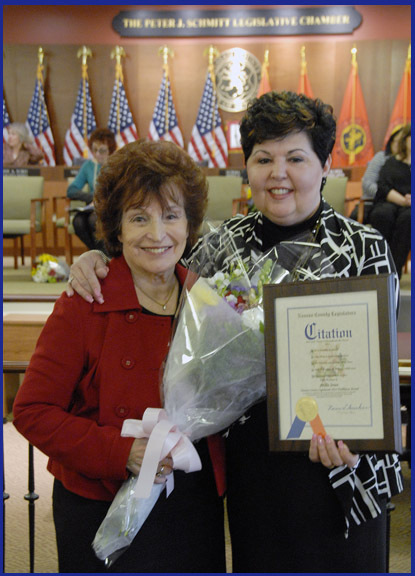 Presiding Officer, Legislator Norma L. Gonsalves recently honored Millie Jones, a resident of East Meadow, as Legislative District Thirteen’s 2014 Trailblazer. Each year, a woman from each legislative district is honored as a “Trailblazer” for her accomplishments in the community. Mrs. Jones, a past president of the East Meadow Chamber of Commerce, has volunteered and helped with the “Culinary Delights” and “Casino Night” fundraisers held annually by the Chamber as well as serving as a member of the Kiwanis Club of East Meadow The Order of Sons of Italy. She has also taken a leadership role with the East Meadow United Methodist Church servingas the Outreach and Staff Parish Relations Chairperson, Nursery School Governing Board and Theatre Group. She is also involved with the "Teddy Bear Sunday Program," a Sunday School Program which has now spread throughout the community and benefits children in the Pediatric Department at the Nassau University Medical Center’s holiday party. Mrs. Jones is the recipient of the East Meadow Chamber of Commerce “Silver Fox” Award for her dedication and hard work for the chamber. She was also honored by Assemblyman Thomas McKevitt with the New York State “Woman of Distinction” Award. Pictured (l-r): Presiding Officer Norma L. Gonsalves; and Trailblazer Millie Jones.